Although there has been a lot hype about iOS 5 integration with iCloud and Twitter, I was pleasantly surprised by the many enhancements to the latest version of Safari included with the update. Below is a summary of these enhancements, some of them expected, others less obvious to discover. Multiple tabs are expected of course but the speed and reliability in opening tabs are a welcome relief over my struggles with Atomic Web browser (which will be dropped from my app list). Navigation is much faster when browsing through web sites such as NY Times. Even browsing is improved within the ANGEL CMS, although there are significant issues with mobile browsing support by Blackboard, but that is a topic for another day. 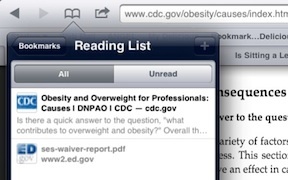 Safari has made distraction free reading - made popular with Readability - as easy as the desktop version with the option to listen to the text as well. 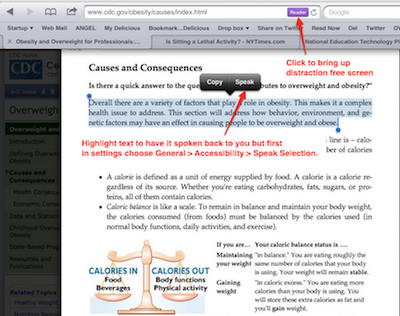 Simply click the Reader button in the address bar to strip away distracting sidebars, advertisements, and animation. Select text and click the Speak button to have the words read back to you. (Not surprisingly it does not appear that the Speak button is available in iBooks, Newsstand or commercially sold media.) First open the Settings app and choose General > Accessibility > Speak Selection. AirPrint still requires an AirPrint enabled printer or special software installed on your Mac or PC (see section below). I especially like the Send to Evernote and Dropbox option with Printopia. Finally with the new version of Safari Mobile you can download attachments and open them with Apple or third party apps that support the corresponding file types (e.g. 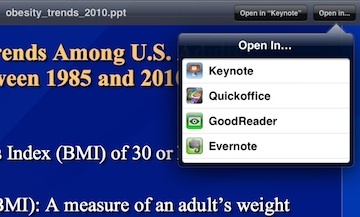 PDF with Goodreader or iBooks, PowerPoint with Keynote or Evernote) - very nice! 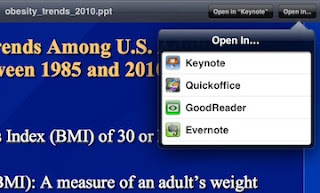 Although wireless printing is now available with an iPad, direct printing to a wireless printer is restricted to a select number of HP printer models:http://www.apple.com/ipad/features/airprint.html. 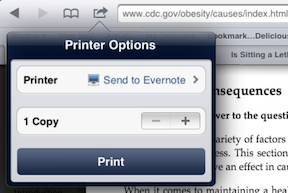 Run AirPrint Hactivator by following these instructions:http://netputing.com/2010/11/11/airprint-hacktivator/. A free, not-so-elegant at your risk solution for MacOS X. Run AirPrint Activator for Windows by following these instructions:http://downloadsquad.switched.com/2010/11/26/airprint-activator-for-windows-lets-you-print-from-ios-on-window/ . A free, not-so-elegant at your risk solution for Windows.